Stretching is one of the best ways to keep your muscles healthy. Stretching regularly will strengthen your muscles and increase your flexibility. The more flexible you are, the better it is for your joints. Keeping muscles and joints in top condition helps with your day-to-day range of motion and can help guard against injury. As beneficial as stretching is, there has been a shift in sports theory regarding how you should stretch and when. For years, experts recommended stretching before you played sports or before you exercised. However, recent research suggests that stretching before a workout does not decrease your chance of injury. Instead, it is more important to do a warmup before exercising. Do not confuse stretching for warming up. A good warmup will boost your heart rate. It will make your body warm all over because of the increased blood flow and oxygen to your muscles. Specifically, your warmup should make you break a light sweat and target the same muscles you’ll use during your sport or activity. Save your stretching for post-game or post-workout. While stretching has long been associated with working out, stretching daily or a few times a week as its own activity can boost muscle and joint health. Adding it to your routine does provide a flexibility that decreases the risk of day-to-day injury. Plus, it helps reduce tension and can improve your posture. Think about waking up in the morning. Most likely, one of the first things you do without even thinking about it is stretch. Stretching is instinctive, meaning that your body already is leading you to do it. While this type of morning stretching is a great way to get up and going, focusing on more targeted stretching during the day will have the greatest benefit on muscles and joints. Even though it is best to do deep stretching post-workout, your warmup can also include elements that have built-in stretches. This is often called dynamic stretching or even dynamic warmup. Examples of incorporating stretching into your warmup include: performing lunges, doing high kicks, pushups, jump squats — almost any heart-boosting activity that engages the same muscles you are about to use in your sports activity or workout. Post workout, your stretching should be even more purposeful. It is important that you stretch to reduce tension so that your muscles can return to a relaxed state. 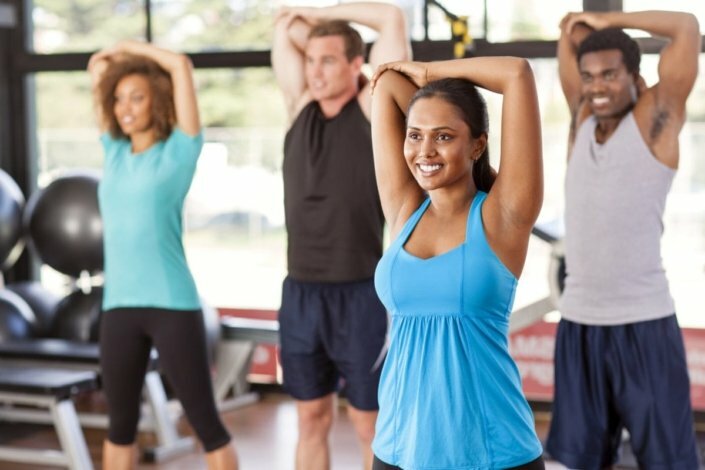 While static stretching (stretching muscles without warming up in an effort to loosen them) before a sporting activity has been shown to decrease muscle strength and power, after workout is a good time for this type of stretching. Your body already being warm from exercise will help lengthen that muscle tissue. It probably won’t prevent soreness, though. If you find yourself getting sleepy at work or school or losing concentration, it’s time to stretch. Stretching at work can guard against repetitive-motion injuries that are caused by deskwork and it can boost energy, as well. You can begin with some simple overhead-arm stretches, but don’t stop there. Do stretches that engage your upper and lower back, your neck, your legs, and even your wrists and ankles. Don’t be embarrassed to stand up and even do a few squats. In fact, standing instead of sitting is a great way to break up your day and get your circulation flowing, so do it whenever you can. Another important time to keep stretching is when you are pregnant. Stretching can keep you feeling your best. It can help prepare your body by lengthening muscles, which can help offset the growing stress on joints. Loose, flexible muscles also help make you comfortable as you carry extra weight. Pregnant women should target upper and lower back muscles, leg muscles, and their chest and hips with stretches. Just remember to move slowly. Pregnancy relaxes your ligaments and joints and can affect your balance. Also, stop stretching if you are in pain. Always listen to your body. It’s all about maintaining that flexibility when it comes to stretching for seniors. Flexibility will help with balance, which is another great benefit. Being flexible and balanced promotes safety in day-to-day activities. Research shows that stretching at least three times a week for 15 to 20 minutes will improve mobility, but doing it five days a week is even better. Before starting a stretching regimen, be sure to talk to your doctor. This is especially important if you’ve had hip or back surgery. Your doctor can guide you to some safe ways to stretch your lower body that won’t aggravate any past injuries. Major muscle groups really benefit from stretching. Focus on shoulders and neck, calves and thighs, hips, and lower back. Stretch evenly on both sides. Hold stretches for about 30 seconds. Remember to breathe. Exhale while going into the stretch; hold the stretch as you inhale. Use it or lose it. You have to keep stretching if you want to maintain your flexibility. No matter your age or condition, there are times when stretching could be a bad thing. For example, lower back injuries can be made worse by certain stretches that target your hamstrings and hip flexors. If you push it too far, you could injure muscles, ligaments, or nerves just by stretching. Stretching should not be painful. A mild discomfort means you are getting a good stretch. If you feel pain, you should ease up or stop. Also, know that stretching won’t prevent overuse injury. However, the overall benefits of regular stretching can make you more nimble and, therefore, minimize injury in that aspect. Before you start any type of exercise or sport, including stretching, you should consult with your doctor. Your doctor can suggest the best way for you to pursue activity that is safe for your body. If, while stretching, you hear a popping noise paired with sudden pain, you should consult your doctor. If you strain a muscle and it does not respond to RICE (Rest, Ice, Compression, Elevation) after a few days, see your doctor. In these situations, your doctor will be able to evaluate and grade the type of your injury. Some muscle tears require surgical repair. The grade of strain will guide your recovery time and level of activity as you recover. What are the best stretches I can do for my body? Can stretching improve my balance? Can I stretch without warming up first? How often do I need to stretch to maintain my flexibility? Is there a preferred order for stretching muscle groups? I stretch every day. Why aren’t I as flexible as my friend? I’m pregnant. What stretches should I be doing, and which should I avoid? I’m a senior citizen. How much time should I spend stretching each week?